We'd love to discuss your staffing opportunities. Reach out to learn how we can help. Finding an applicant that is the right fit for a company is difficult enough, but maintaining relationships with a network of people for future opportunities is nearly impossible. TriMech Staffing has developed its recruitment model around acquiring key talent. At TriMech Staffing, we provide our clients with key technical candidates to fill those expected and unexpected positions, and we do it quickly because we know how valuable your time is. Our team of recruiters have the experience and expertise necessary to support your contract, contract-to-hire, and direct hire openings. We use focus, knowledge of the fields. TriMech has been operating in the Engineering Sector supporting both Department of Defense (DoD) and Commercial clients with specialized recruitment support for contract requirements as well as direct hire candidates. We can provide cleared resources for projects of any length. TriMech understands our clients’ technical needs. We don’t employ buzz words to help our cause; instead, we focus on the comprehensive skill sets needed by our clients and then match candidates that have the necessary background to fit our clients’ cultural environment. 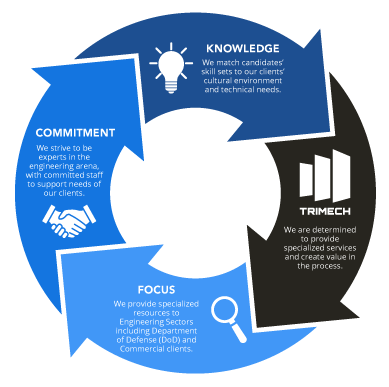 TriMech is determined to provide specialized services and create value in the process. We don’t have a desire to be the one-stop staffing shop, but rather experts in the engineering arena, with a staff to support the various needs of our clients. Whether you are looking for your next career opportunity or if you are looking to line up your next contract opportunity, TriMech Staffing can assist you with that search and match you with a client that fits. When you work with TriMech Staffing, you can expect to work with a highly professional team of recruiters and account managers who will assist you in deciding on which positions fit your technical expertise, as well as how your industry experience matches up with our clients’ needs. Once our recruiters determine which positions fit your needs, we can work to provide the necessary client information to ensure you are prepared to move forward in the hiring process.